I am really loving Jolly Holidays! I want to try each cut... we'll see! Jolly Holidays for the bird, All paper is from Tis the Season Paper Pack, Season's Tweetings from Pink by Design Winter Fun. I also folded my ribbon this time! ( A first for me) I really like how it turned out! DecoArt for the white on the hat. I used From my Kitchen for the Cherries and Stampin Up Fruit Phrases. Paper is from the sweet stack. Divine Swirls for the embossing and diamond stickles. I love making these tags! They are such a fun way to use up paper and fun embellishments! This one is two sided and is 4 3/4". Paper is from the Tis The Season Paper Pack, The ginderbread men are a Cuttlebug Die Cut and the mittens are from Jolly Holidays! I wanted to join in on the Peachy Keen Challenge "encouragement", so I looked at all my stamps and liked this sentiment best! I can't believe I made a "sports" type card! But it came together exactly like I wanted it to! Baseball Cricut Cartridge, Peachy Keen PK-504 and Inkadinkado for the quote. Create a card of ENCOURAGEMENT. I am soooo loving this Jolly Holidays! This turned into a 5X7 card because the words cut so big! This Merry Christmas is from the Jolly holidays too! Swiss Dots embossing folder and a little red chalk to help the words pop. Some fuzzy ribbon and some fun thingees! Paper is also from the DVWV Tis the Season Stack! Cricut Cardz Challenge: make a Christmas themed card with WORDS ONLY no image. I was so excited to give Jolly Holidays a try! I also used my paper from the DCWV "Tis the Season Paper pack I just picked up at Micheal's for only $6.99! Jolly Holidays for the tree. Craft Creations: # 95 Christmas is coming! 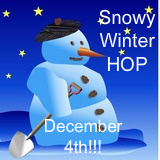 Just a reminder The Snowy Winter Hop is Dec 4! And it is a line up you don't want to miss! My "Sick as a Dog" Card won over at Fantanous Cricut! And thank you to Kathryn over at creations with Kathryn! I won her thankful blog hop! A new challenge blog is launching this week! Black Friday Deals! I left my house at 4:45 pm and returned home at 6:45 am! Then went to see Tangled! So super adorable!! My chickies loved it! My haul from Micheal's! I went with my friend Andrea and we had so much fun! And Tested my luck at Wal-mart! I just happened to be at the right place at the right time and was able to quickly grab the Jolly Holidays! I hope everyone had a great holiday and was able to score some great deals! I hope everyone has a wonderful Thanksgiving tomorrow! I would love to hear about your funny traditions, so please feel free to tell me about them in the comments! So three years ago it was about 9:00PM and he says to me, you should cook the turkey now that way you can come out to play too. And of course I said "Great idea!" So at about 3:00am we carved the turkey and had it for breakfast the next day! Now every year I cook the turkey the night before so that I am not ditched on Thanksgiving! I get to go and enjoy the day! I plan on making yummy sandwiches to take on our bike ride tomorrow, so we will have a Thanksgiving Day Picnic! I am planning on going to Micheal's on Thanksgiving!! I hope to score some good stuff! Like I need more stuff, this is the current condition of my space! Well once my other Daughter heard that her Sister was allowed to join in on a challenge she wanted to do one too! Create an invitation for a holiday party. or even just a gift opening party! She was thrilled because she said "I will send an invitation to Santa to come and visit us for dinner." She selected all the papers, tested out different flower colors, stamped your invited and cut a Christmas Dinner phrase off of pattern paper! 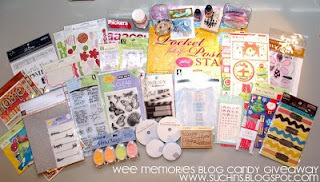 Wee memories is having candy and they are a challenge blog! BONUS! Well that's it! Pretty boring! Enjoy! You all deserve it! So I said I cut my last Turkey a few days ago.... but when my chickie heard I would be skipping a few challenges because I was Turkey-ed out she said "I will do it!!" I was lucky enough to have the day off today!! Yippee!! As you can see from all my posts I spent my whole time crafting, and LOVED every second of it!! This will probably be the last post for tonight, I am off to play a mean game of Dodge-ball with the neighborhood kids! Wish me luck! I give out lots of gift cards at Christmas time, so I wanted to make some really fun holders for them. I used Wild Card Cartridge Page 46. The exact size to fit a gift card is to cut it at 4 1/4"
I measured and cut the extra pieces for the front and back. You can cut liners but I could not seem to match them up the way I wanted. The gingerbread men are from Stretch your Imagination. I used Peachy Keen faces and the DecoArt Snow writer to decorate them. Added lots of bling! Staying Crafty: Create beautiful gift packaging for the holidays. Cricut-less!! This made me use things I usually forget to use! I used my Cuttlebug Thank you Embossing folder, eyelets, prima flowers and colored staples. My Creative time: Must be a "CRICUT~LESS" project that consists of some kind of "THANK YOU" on it! Get Well Soon! I always forget how much I love Paper Pups! They have the cutest puppies on it! Paper Pups for the Puppy on bed, I used a little flower stamp to decorate the blanket and added a spot of Stickles. Cricut markers were used for Sick As A Dog. I stamped and embossed the inside with Get Well Soon! Fantabulous Cricut: Challenge #36 Achoo! As always there needs to be an image cut using your Cricut on your project to be eligible for the prize. I think this might be one of my favorite things that I have made! I love everything about it! I used Plantin Schoolbook for the tag and Create A Critter for the Christmas Trees. Decoart Snow writer is what I used to line the trees with to look like snow. (This stuff is awesome!! only $2.99 at Joanns) Distressed the sides and used pink ink. Added some bling and ribbon! Paper Cutz: For challenge # 68, make a card, LO or craft project for Christmas using LOTS of bling and any colors you'd like. Make any paper project about something you love, for someone you love, using a technique you love..... you get the picture.